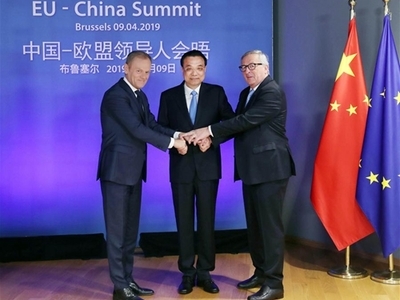 China is glad to see a united and prosperous Europe and hopes to expand two-way opening-up while safeguarding free trade, Premier Li Keqiang said on Tuesday in Brussels. Li made the statement when meeting with Belgian Prime Minister Charles Michel in the capital of the European Union member country before he attended the 21st China-EU leaders' meeting with European Council President Donald Tusk and European Commission President Jean-Claude Juncker. China's relations with Belgium are a vital part of its ties with the EU, and Belgium is expected to continue playing a positive role in promoting the development of China-EU relations, Li told Michel. The premier spoke highly of the current relations between the two countries and said China will strengthen cooperation with Belgium in diverse fields and exchanges in regional and international affairs. He called on both countries to fully carry out consensuses that have been reached to make new progress in their all-around partnership of friendship and cooperation. China is willing to import more high-value-added Belgian products that cater to demand in the Chinese market, and Belgium is welcome to participate in the second China International Import Expo this year, Li said. In the meantime, the world's second-largest economy will work with Belgium to fully implement their memorandum of understanding for third-party market cooperation to enhance their cooperation in Africa, the premier added. Michel said Belgium has attached great importance to its relations with China and will deepen bilateral cooperation in trade, agriculture and shipbuilding. He said he hoped the China-EU leaders' meeting would be successful, safeguard multilateralism and promote trade. On Tuesday afternoon, he had talks with Tusk and Juncker. A number of cooperative agreements were signed after that. Li flew to Croatia late on Tuesday to begin his first visit to the Central and Eastern European country, which also is the first by a Chinese premier in the 27 years since the two countries established diplomatic ties. He will also attend the eighth China-CEEC leaders' meeting in Dubrovnik. In a signed article published on Tuesday by several Croatian newspapers, Li said China will open up further to unlock the potential for trade in goods and promote two-way trade and investment liberalization and facilitation. More competitive goods from CEE countries are welcome in China, which is committed to working for more balanced trade. Li also called for more opportunities in the new economy and new growth drivers in the digital economy, e-commerce, financial technology and smart cities.